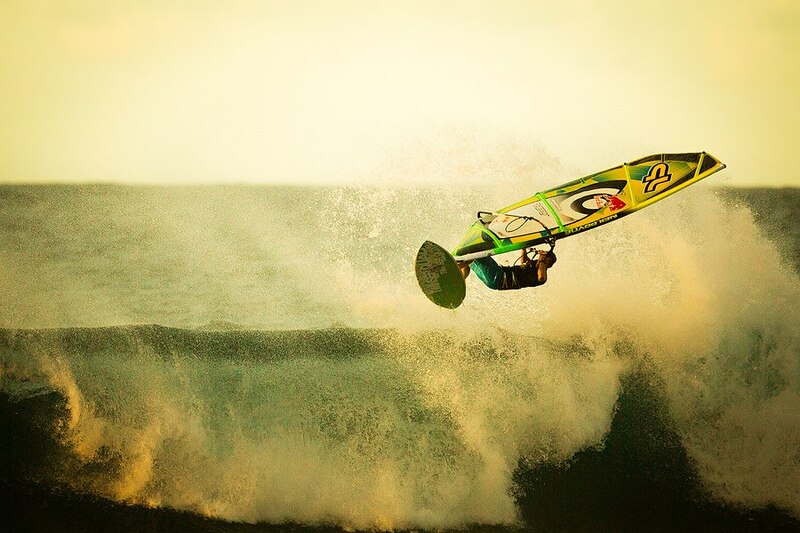 The right stuff for radical action at Hookipa! The AWT is proud to announce the confirmation of the PWAs involvement in the 2013 JP Aloha Classic. For the first time in 7 years, the PWA World Tour will be back on Maui to put the world best windsurfers against some of the world’s best conditions. Taking off where it left off in 2006, the Aloha Classic will once again be supported by JP Australia, highlighting the unbreakable bond between the JP name and the world famous surf of Ho’okipa Beach Park. Our Slogan The Right Stuff for Radical Action matches perfectly with the image of Ho’okipa as one of the most radical wave spots on this planet. We did not have a PWA event on Maui since we sponsored the last Aloha Classic in 2006. So we at JP finally decided that it is time again that we step up and become the title sponsor and bring the best wave sailors back to Maui for a PWA competition. We are very proud that we can help to make this finally happening and we look forward to see the best and most radical wave riders perform in the prestigious Aloha Classic. Jason Polakow who was the first non-Hawaiian ever win in Ho’okipa will unfortunately not be able to compete as he has other commitments in an event on Mauritius but he will be attending the opening ceremony of the event and he will keep his fingers crossed for his JP team mates. Building on the success of the AWT Makani Classic during 2011 and 2012, the JP Aloha Classic will bring together the burgeoning American Windsurfing Tour and the PWA World Tour for the first time. The PWA and AWT have been working tirelessly throughout the last 12 months to make this event a reality and the stage is now set for what promises to be a showdown on a titanic scale. Since we began the Makani Classic at Hookipa 2 years ago, our goal has been to build a bigger and better event which will bring more top level athletes to the event. The addition of the PWA to the line-up will add another level to an already great competition and we are happy to see the contest continue to develop. Its great news for the tour and for the sport that we will finally be going back to Ho’okipa after 7 years and its fitting that we will be doing it with JP who have once again stepped up to cement their relationship with wave sailing at the highest level. We are grateful to Sam Bittner at the AWT for her support and efforts in building the foundations of the event through the Makani Classic and we are confident that this will be the start of strong future for PWA events on Maui. The windsurfing world will finally get the match up they have been looking for as the Hookipa specialists and AWT regulars take on the best of the rest of the world. Legends in the sport such as Levi Siver and Josh Stone will throw down with tour regulars like Victor Fernandez, Ricardo Campello and, of course, current PWA Wave World Champion, the goliath that is Philip Koster, to finally decide who is the master on Maui. The action will take place between the 24th October and 6th November. More information will be released over the next few days. 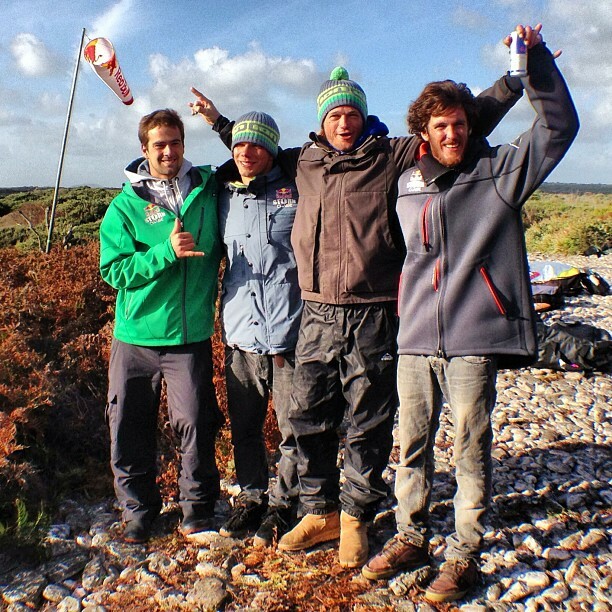 COLD HAWAII PWA WORLD CUP – BRAWZINHO WINS! The final day of the KIA Cold Hawaii PWA World Cup saw an enthralling day of competition as Cold Hawaii returned to life with a vengeance, as howling winds and big, powerful waves arrived just in the nick of time to allow a result to be gained for the fourth successive year. 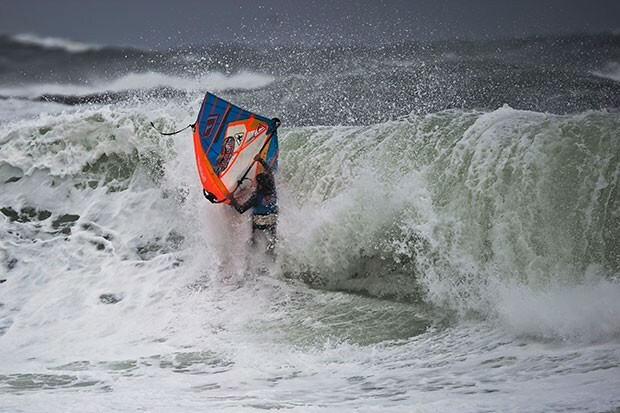 Today will live long in the memory of Marcilio ‘Brawzinho’ Browne (Goya Windsurfing / MFC), who managed to tame the ferocious North Sea, in front of a packed out crowd, to secure his first ever event victory on the PWA World Tour. The forecast came true for the 2013 ATW Hatteras Wave Jam as two solid days of competition allowed for the completion of all divisions. The AWT scoring system paid off as all competitors are allowed a second chance if they mess up in the first round encouraging riders to really push the limits of their skills. Day one saw strong wind and moderate waves that were perfect for getting the first couple rounds of the Masters and Amateur divisions in the books. Day two showcased slightly less wind but bigger and cleaner swell, which allowed the pros, women and advancing Masters and Amateurs to really show what they could do. Some of the world’s top wavesailors were here to vie for the AWT Hatteras Wave Jam title and the competition was very close. The final came down to a battle between Andy McKinney, Fabrice Beaux, Bernd Roediger and Kevin Pritchard. McKinney is the owner of a local shop (Wind-NC) and used his Hatteras knowledge to advance to the final and finish in 4th position. Beaux absolutely ripped his way through the heat up to the final but struggled to find the best set waves resulting in a 3rd place finish. The battle for the top spot was close with Pritchard’s powerful style matching up against Roediger’s new-school moves. Roediger took the heat with the wave ride of the event that included a big one-handed aerial and a Taka. No division embodies the true spirit of the AWT more than the women. They are willing to go out and rip whenever called upon no matter the conditions and they always do so with a smile on their faces—”no complaining…just ripping!” This year Miho Tanaka of Japan defended her title from last year winning over Sam Bittner (2nd) and Kerri Stokes. Sam Bittner sailed very well but couldn’t match the far more experienced Tanaka (who also competed in the Pro division). It was Stokes first time sailing in the waves and what better time to do it then at an AWT event… congrats to Kerri Stokes! Both the amateur and masters divisions were tight battles. The Am final featured George Marcopoulos, Ken Ahrendt, Ian Stokes and Casey Treichler. Marcopoulos sailed well this entire event finishing just off the podium in 4th place. Ahrendt of the local shop Ocean Air not only kept many visiting riders stoked by lending them gear but sailed a strong heat to finish in 3rd position. The top spot came down to a close fight between young gun Stokes and the “Reef Warrior” Treichler. Both these guys know this wave very well and had the perfect gear to suit the conditions. In the end Treichler found the better set-wave to rip apart giving him the Am Wave Jam title. The Masters final featured a 4-man heat of Dave Kashy, Gordy Stokes, Ken Keller and Mike Wazenski. All had been sailing very well through the competition and in the end Kashy took the top podium spot over Wazenski (2nd), Keller (3rd) and Stokes (4th). Sunshine and brilliant waves came on day three of the KIA Cold Hawaii PWA World Cup, but no wind was to be found. The call of the day was to run a SUP competition which saw the pros take on the locals. The competitors took full advantage of the clean, peeling waves to produce a fantastic display for the crowds. Day two of the KIA Cold Hawaii PWA World Cup started in the pitch black as the competitors and race crew congregated at the Cold Hawaii club house at 6am. The early start, however, didn’t pay off as the forecast that promised wind from first light failed to materialize due to the offshore direction. After seven and a half painstaking hours the wind finally followed forecast as it swung cross-off shore allowing the competition to begin shortly afterwards, in perfect, peeling down the line waves – half mast to logo high – and light to medium winds, which saw two waves to count over the duration of eighteen minute heats. Moritz Mauch, Lars Gobisch, Albert Pijoan, Markus Rydberg, Peter Volwater and Robert Baldyga all advanced through the three trials heats for main competition. In the first heat of the contest Brazilian Marcilio ‘Brawzinho’ Browne looked in superb form today after he confidently dispatched of Mads Bjornaa. On the B-side of the panel Moritz Mauch achieved the biggest win of his career so far as he managed to defeat Dany Bruch. Heat Two Began but had to be abandoned due to deteriorating conditions. Kiri Thode finally ends Gollito’s unbeaten run and Sarah-Quita Offringa grabs a straight six. The return of the PWA to the Netherlands for the first time in fifteen years proved to be a huge success as Brouwersdam produced a superb blend of conditions for the elite of the freestyle world. Anything from storm force winds combined with heavy rain, to glorious evening light with 20 knots and perfect flat water greeted the competitors over the course of the week. Sarah-Quita Offringa (Starboard / Gaastra / Mystic / Chris Benz / Maui Ultra Fins) proved once again that she is in a world of her own as she emphatically claimed her sixth PWA Freestyle world championship in a row. In the meantime Kiri Thode (Starboard / Gaastra) ended the reigning world champions – Jose ‘Gollito’ Estredo (Fanatic / North) – unbeaten record, as the Venezuelan tasted defeat for the first time since 2012 – but more importantly Thode claimed the event victory – his first since 2011 – to blow the title race wide open. 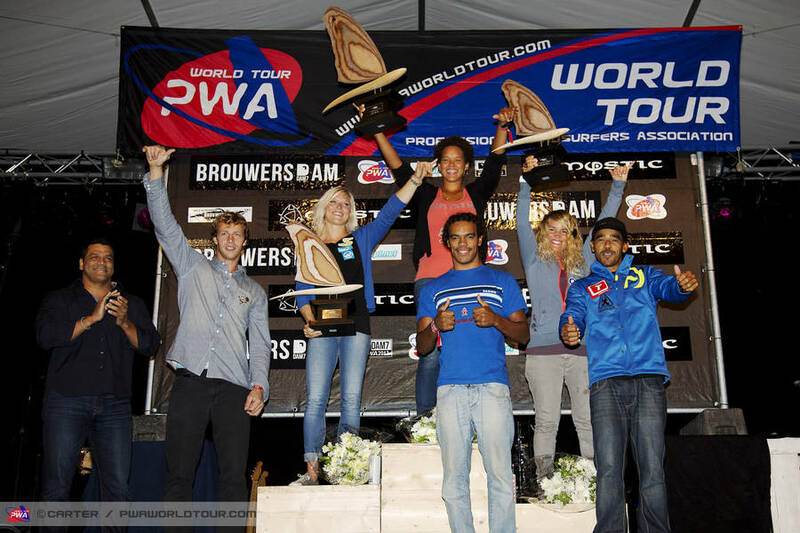 Camille Juban wins the American Windsurfing Tour Pacasmayo Classic 2013 PRO division. Congratulations! The final day of the PWA Pegasus Airlines World Cup saw two more eliminations completed for both the men and women as the Meltemi wind continued to blow for much of the day. At the end of the day Antoine Albeau (RRD / NeilPryde) battled his way back to the top of the rankings to secure the event victory, with one bullet and a second place today. Meanwhile, in the women’s fleet Sarah-Quita Offringa (Starboard / Gaastra / Mystic / Chris Benz / Maui Ultra Fins) continued to dominate with back-to-back elimination victories on the final day to emphatically claim the event win, but the biggest news of the day involves Delphine Cousin (JP / NeilPryde) who will remember this day forever, after clinching her maiden world title as she was crowned the 2013 PWA Women’s Slalom World Champion. The fourth day of the PWA Pegasus Airlines World Cup proved to be a largely frustrating affair as teasing winds kept the competitors on standby for much of the day. After a very quiet start to the day at 12pm the wind swung 180 degrees and began to rapidly pickup causing a flurry of action on the beach. However the wind remained gusty for much of the afternoon meaning that only a further two heats were completed – one men’s and one women’s semifinal. In the men’s semifinal – Heat 13 – Pierre Mortefon (Fanatic / North) showed good speed again to win the heat, whilst Ben van der Steen (Starboard / Gaastra / Mystic / Different), Julien Quentel (RRD / NeilPryde) and Alberto Menegatti (Starboard / Point-7) all qualified for their first winners’ final of the week. In the women’s semifinal – Heat 5 – Marion Mortefon (Starboard / Severne) made the best start to the heat and safely qualified for the final with a proficient display, whilst Lena Erdil (Patrik / Loft Sails / Mystic / AL360) claimed second place. The remaining qualifying places were clinched by Karin Jaggi (Patrik / Severne) and Ayako Suzuki (Starboard / Gaastra / Mystic) meaning that local hero Cagla Kubat (Starboard / Loft Sails) misses out on a place in the winners’ final. A frustrating day for competitors as winds fail to cooperate. 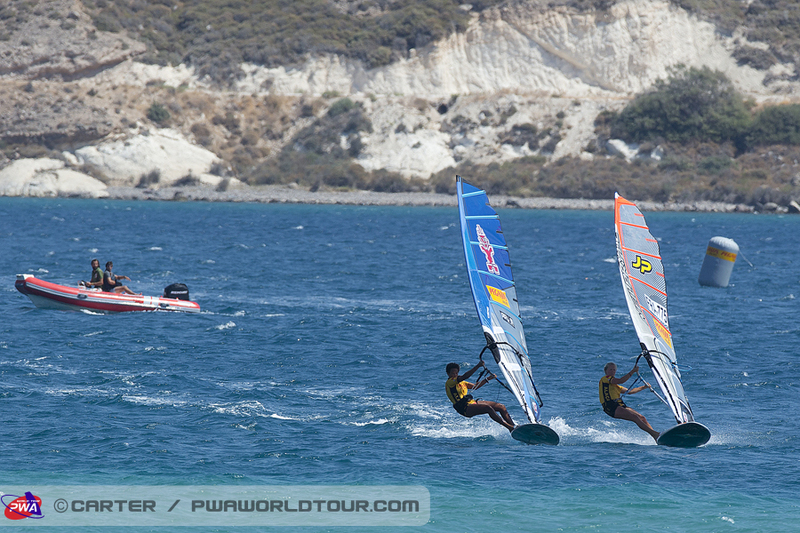 Day three of the PWA Pegasus Airlines World Cup saw just three heats completed in the women’s second elimination dues to light and flukey winds. Conditions looked to be improving quickly by 2pm, but it didn’t last long as 5 knot holes were to be found on the race course. The day continued to frustrate with many heats started and then abandoned, first men’s semi final. However three women’s heats were completed. In heat two, the first heat of the day, local hero Cagla Kubat (Starboard / Loft Sails) was victorious, while Marion Mortefon (Starboard / Severne), Lena Erdil (Patrik / Loft Sails / Mystic / AL360) and Gelly Skarlatou also qualified for the next round. In heat three Burce Vardarli, Melek Toraman (Starboard / Loft Sails), Ceren Yaman (JP / NeilPryde) and Deniz Sekercioglu qualified. Heat four saw Marianne Kaplas (Starboard / Severne) who finished first in her heat. Also qualifying from heat four were Delphine Cousin (JP / NeilPryde), Valerie Arrighetti (Tabou / Gaastra / Mystic) and Sarah-Quita Offringa (Starboard / Gaastra / Mystic / Chris Benz / Maui Ultra Fins) respectively. Racing is scheduled to resume tomorrow at 11am, if conditions allow. 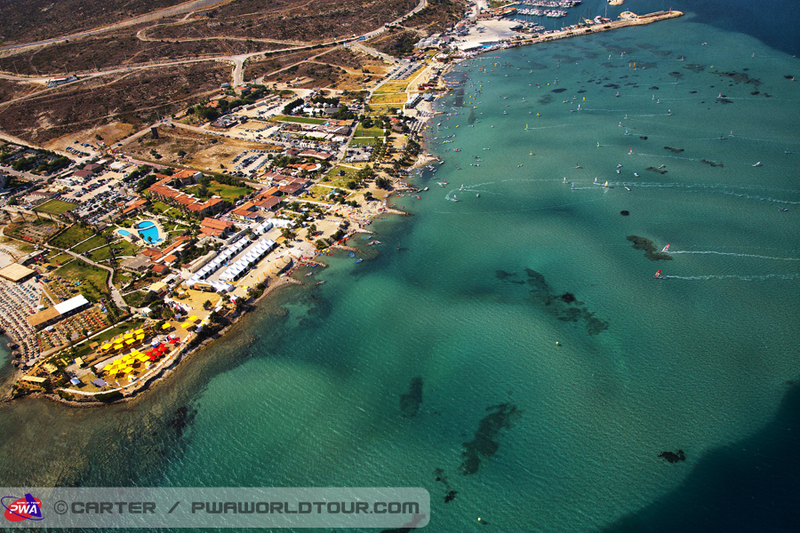 It was a hot and dramatic day for the PWA Alacati World Cup. Winds didn’t pick up until mid afternoon, and two and half hours of competition resulted in 9 more men’s heats being completed. Read the full story here on PWAWorldTour.com. Antoine Albeau and Sarah-Quita Offringa get off to perfect starts. 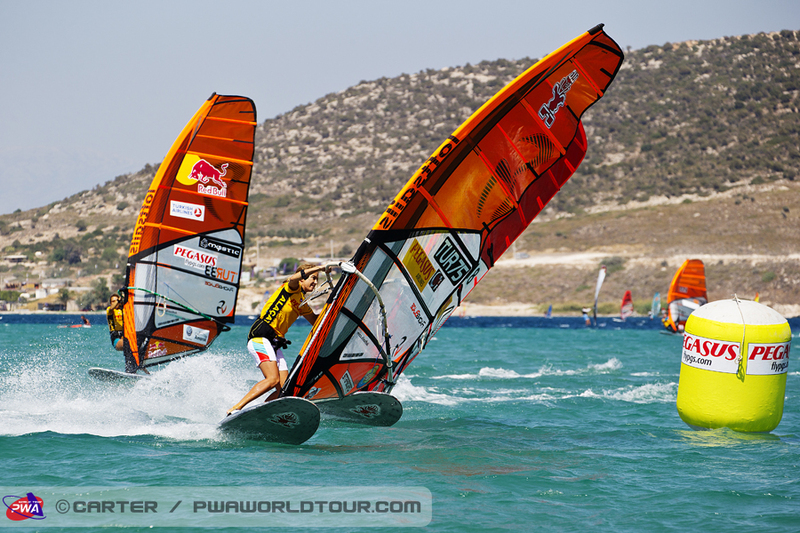 The inaugural day 2013 PWA Pegasus Airlines World Cup began with a bang. the Meltemi wind in full swing the opening eliminations of the week started just after 1pm. Both men’s and women’s fleets had a result by 4:30pm as Antoine Albeau (RRD / NeilPryde) and Sarah-Quita Offringa (Starboard / Gaastra / Mystic / Chris Benz / Maui Ultra Fins) claimed the first bullets of the week with commanding displays. Four riders are advancing to mission #3 in the Redbull Storm Chase. The four riders are Marcilio Browne, Leon Jamaer, Dany Bruch and Thomas Traversa! It was an intence last day of action as riders battled for the four spots to mission #3. Riders head to BOL (Back of Lighhouse), where a small cove allowed access to a long, peeling point break, with swells well over mast high. Riders launched them selves into huge aerials, big back loops and powerful turns. Stay tuned as galleries and videos become available! 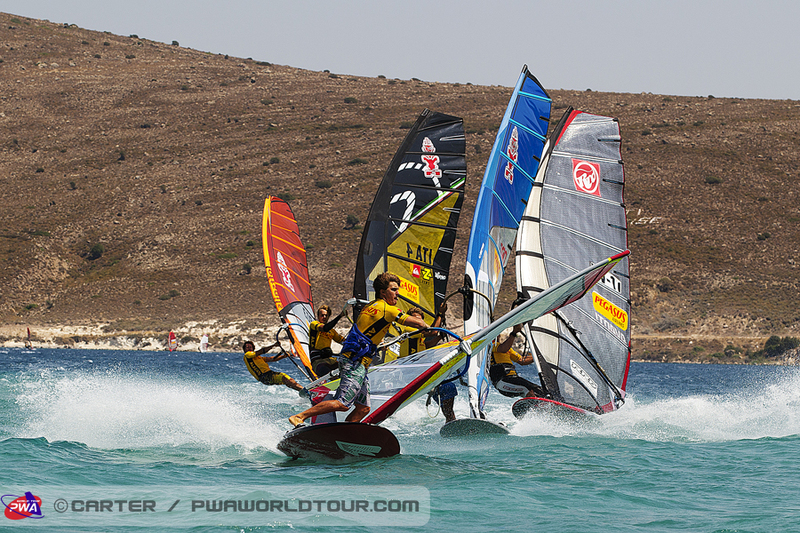 The PWA slalom tour returns with some high speed action tomorrow in Alacati, Turkey. From the 19th to the 24th August both the men’s and women’s slalom fleets shall be returning to action for more warp speed racing as they head to the stunning turquoise waters of Alacati, Turkey. The men will be recommencing battle for the first time since competing in Costa Brava – in June – whilst the women will be fighting it out for the final time this season. Six days of furious slalom as the women’s title race draws to its conclusion in their final event of the year, whilst the men’s title campaign continues to gather pace in their penultimate event of the season as they battle it out for those crucial world tour points. Who to watch for the men? 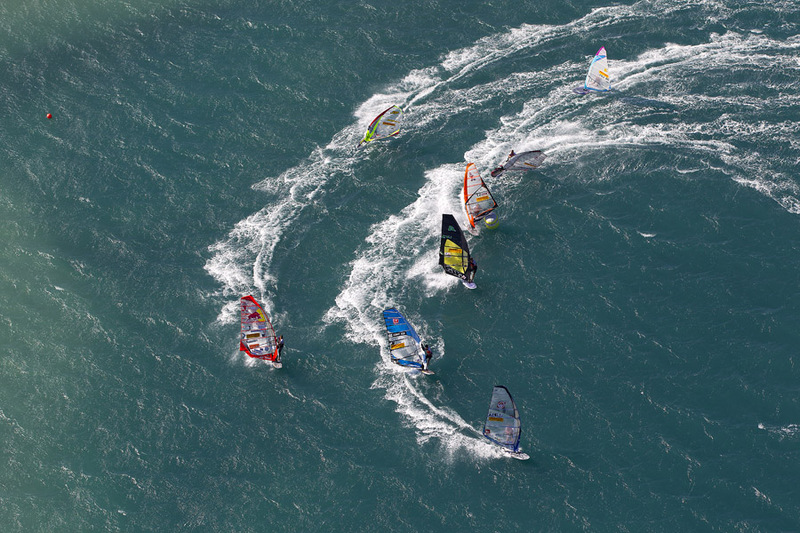 Antoine Albeau (RRD / NeilPryde) will enter the event as the favorite, and currently leads the rankings. His fellow teammate Julien Quentel (RRD / NeilPryde) currently sits in second, with Alberto Menegatti (Starboard / Point-7) wrapping up the top three. Also sitting in the top ten are some big names no doubt looking to improve there position. Notably Micah Buzianis (JP / MauiSails), Josh Angulo (Angulo / Gun Sails), Finian Maynard (RRD / Avanti) and more. On the women’s side, things will be intense as this event decides the titles for the 2013 slalom season. Karin Jaggi (Patrik / Severne) currently leads and looks to wipe the bad taste of last season out of her mouth after she narrowly missed the title. Looking to upset the leader is Twenty-two year old Delphine Cousin (JP / NeilPryde) currently occupies second place. Sarah-Quita Offringa (Starboard / Gaastra / Mystic / Chriz Benz / Maui Ultra Fins) the 2011 title holders joins the tour late having missed the first event. With so much at stake the week ahead promises to be an intense event for the women. Stay tuned for more action as it unfold in Alacati. The open day of Mission #2 of the Red Bull Storm Chase saw a full round of competition completed in challenging side-on, starboard tack conditions at ‘Temm’ in the North West of Tasmania. Strong winds reaching 64 knots and large swell up to 25-foot facesmeant it was game on! A series of reefs near Temma Harbour offer good side-shore (wind from right) options in North or North West wind directions. The access is good with plenty of grassy areas for the crew infrastructure and athletes to prepare their equipment. Having a harbour and slipways nearby aid the safety backup crew and provide further launching options for competitors in large surf conditions. Competitors were divided into two man heats, with a twenty minute duration. Head Judge Duncan Coombs made the call for competitors to be towed out of the more sheltered bay behind the main foreshore and beyond the wind line in the middle of the bay. Instead of a knockout format, the scoring system counted each riders best two jumps and wave rides, the total of which will be used to determine the overall winner following each further round. The first heat between Leon Jamaer and Marcilio Browne was cancelled as both riders struggled to get into position for set waves or to line-up jumps. Rainbows followed heavy showers and, as the wind built, peaking at 64 knots it was game-on! At the end of the day Thomas Travers dominated and took the highest score for wave rides and jumps. Head judge Coombs said, “said “Thomas rode the surf in the most critical situations and looked totally in control – it was like he was playing with the storm while others were struggling in comparison”. 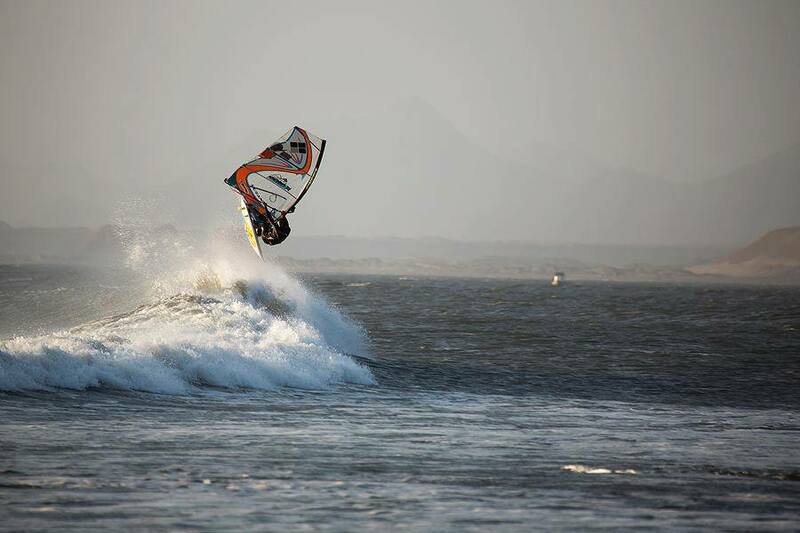 Marcilio Browne also impressed with a very hight tweaked push loop and some solid wave scores. Leon Jamaer went for gnarly wave 360s off vertical sections, showing little fear for the insane conditions.